Good landing pages give you better sales conversion and pages with unique content, which improve your site rankings in search engines. The module lets you decide which content to display on the pages - selected products, banners, text info, CMS blocks. You can specify custom meta tags and short SEO url for each landing page. It's not a secret that for successful online store promotion one need to effectively implement SEO for Magento. The module enables you to create landing pages based on different parameters, so that the page content does not get duplicated. This way you get more unique pages indexed by Google. To implement complex seo solutions in your store use feature-rich SEO Toolkit module comprised of 7 different search engine optimization extensions. One of the most effective Magento SEO tips is to specify individual meta keywords as well as meta title and description for pages, so that they are optimized for the content of each particular page. With the Landing Pages tool you can easily do this for each page of your website. The extension includes canonical URLs functionality to prevent content from duplication in search engines. Moreover, it supports category URL suffixes. For example, when you define URL suffix .html for your store product and category pages (System -> Configuration -> Catalog -> Search Engine Optimizations), the extension will include .html suffix in the canonical URL too. With the extension, you can specify short URLs for the pages, like yoursite.com/page1, yoursite.com/page2, etc. Moreover, it is possible to use a proper URL structure: the sub pages aliases with more precise keywords are devided with the slashes. All links to landing pages are added to the sitemap, after the links to CMS pages. After the landing page is created, quick links to frontend will be automatically added to the 'Landing Pages' grid. So, you can check whether the landing page is properly configured right from your admin panel. Landing pages for new products and products with special price. Many customers look for new and discounted products. Knowing this, it is a good thing to create special pages for such customers, so that they can quickly find such products without having to endlessly browse through the whole catalog. When offering deals for some type of products (e.g. 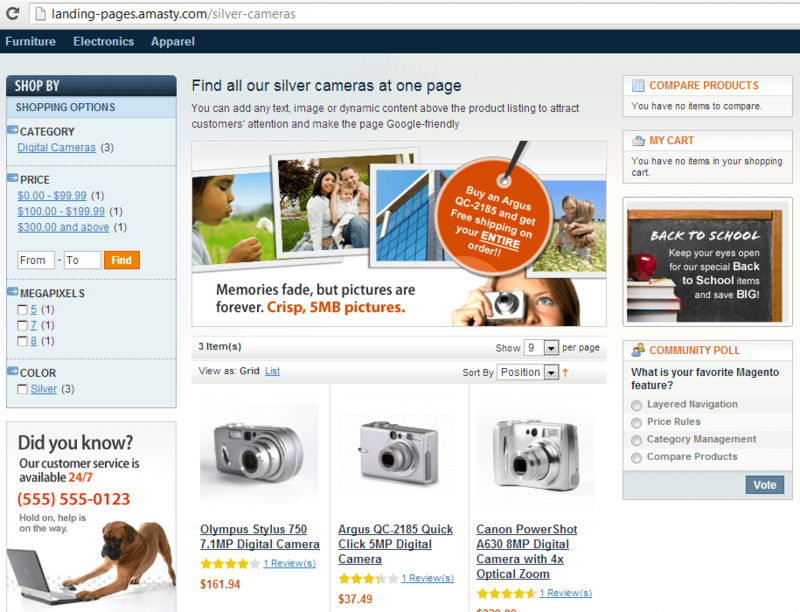 canon cameras with price less than 200), it is very convenient to create a separate page for such items. Customers will be a lot more likely to find such products and follow your offers. So you get more orders and loyal customers. To double effect, you can combine this extension with Custom Stock Statuses! Advanced filter enables you to specify up to 30 flexible product attribute conditions and combine them according to your needs. Create pages based on attributes and categories. You can create Magento landing page templates based on a category and any combination of attributes. E.g. you can show products from phones category of HTC brand and black color. Now the creation of landing pages based on search results has become as easy as it can be. Simply specify the word to filter out the products containing this word in any part of the text. There is no more need to specify any other additional symbols. Since now when we filter the products for the landing page by some attribute, parent configurable products are shown in the filter results. Enhance customers’ shopping experience with the help of default sorting options. The extension offers you sorting on such criteria as ‘Best value’, ‘Name’ and ‘Price’ to arouse a keen customers’ interest and notably scale up your sells. Speed up the purchasing process by giving your customers more sorting options with Amasty Improved Sorting module. The extension is fully compatible with Amasty Landing Pages. This compatibility enables customers to easily choose products on advanced sorting criteria ( ‘New’, ‘Top Rated’, ‘Best Sellers’, ‘Most Viewed’, ‘Reviews Count’ etc). 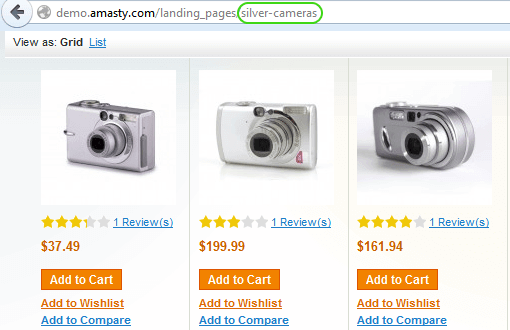 Now you can choose multiple categories from which the products will be displayed on a particular landing page. This easy-to-use feature will help you to carefully fine-tune your landing pages and launch even more effective promotion campaigns. Let's say you have a landing page for new products. The page will automatically update its content and will show new products once you add them to your catalog. This works for all attributes combinations. new!Specify the custom design theme for each landing page. Show summary products rating and the most attractive product price on the bottom of the landing page with Google Rich Snippets module. new!It is possible to import and export landing pages in .csv format. 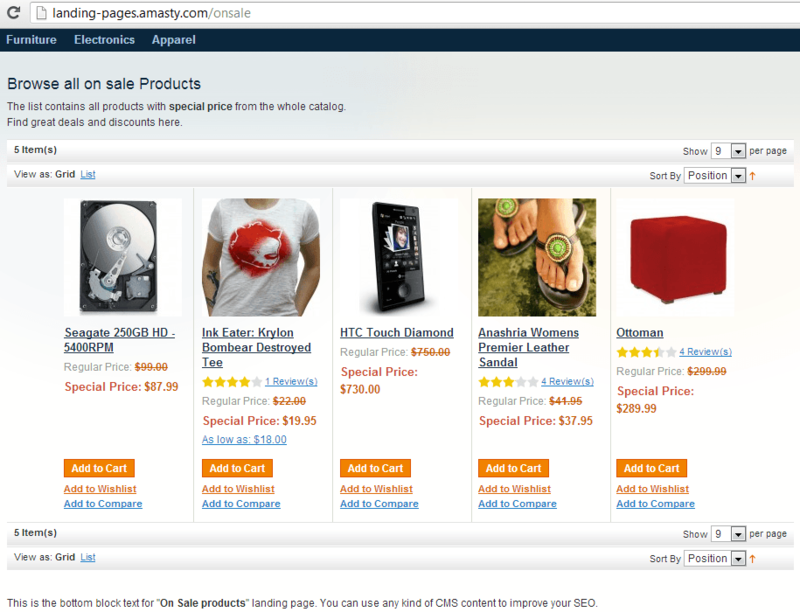 You can display only the products which are in stock on landing pages. You can choose 1, 2 or 3-column layout for landing pages and customize it. It is possible to include CMS-blocks above and under the product list on landing pages. Support of Magento multi-website structure. Full compatibility with Improved Navigation and Improved Sorting extensions - products on landing pages will be filtered and sorted by these two modules. The extension is fully compatibile with the Full Page Cache extension - speed up your landing pages to create an outstanding user experience. You can greatly enhance landing pages' extension functionality in Magento 2 adding pages to navigation. How to make your Magento landing pages fully optimized? Try out our Minify JS-CSS-HTML for your Magento. Optimize your landing pages code structure to achieve higher positions in search results. Can I create different landing pages for different store views? The extension supports multi-website structure, so you can create different customized landing pages for separate store views. All you need is to make changes in the general settings. Read on to see the screenshot. Can I add some text to my landing page for better SEO? Yes, you can change landing pages. There are two fields – Top Description and Bottom Description – where you can insert text that will be displayed on your landing page. How can this Landing Pages module detect new products to display them? There are 2 possible algorithms: 1) use magento default attributes "new from" and "new to" or 2) set the new period in the module setting and use product creation date. Can I display products from multiple categories on my landing page? Yes, the module allows for displaying products from more than one category on a landing page. Read on to see the screenshot. Can only particular SKUs be displayed on a landing page? Yes, with the use of the advanced filter you can set up the condition so that only one SKU of a single product will be displayed on a landing page. Read on to see the screenshot. Can I use a range for a price attribute? Yes, sure. For this, you need to make relevant changes in the advanced filter. Continue reading to see the screenshot. Does this module work correctly with the “Enable Flat Categories and Products” option? Our Landing Pages module works well with the Flat Categories and Products option. But in case there are still any issues our support managers will fix them for free. Is it possible to import Landing Pages? Yes, with the module you can import/export landing pages in .csv format. Continue reading to see the screenshot. Is this module compatible with custom navigation extensions? Our Landing Pages module is fully compatible with default Magento navigation and our Improved Layered Navigation. How to change a sort order on a landing page? How to set noindex, nofollow tags on the landing pages? I don't know how I lived without this extension this long. 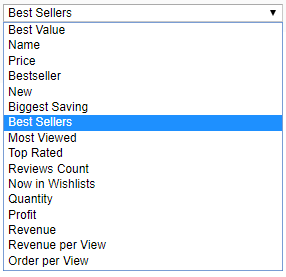 It is so much easier than creating a special category when you want to group products together. I love it for sale pages, vendor specialty items, etc. Hoping that the pages will also help improve SEO after they have had some time to take affect. Wish I bought this years ago. Amasty installation service was well worth it too. A very useful extension to make landing pages for sales, nyew products etc. We had some conflict on a landing page. We asked Amasty support to check if there was a mistake. They found the mistake that was caused by something that had nothing to do with the Amasty extension and gave us hints of how to solve the problem. We are very happy customers. This extension works perfectly, the developers even managed to add an extra function that I requested almost immediately. Very impressed with the support. This extension is exactly what we were looking for. We recently moved away from another shopping cart platform and found that one of the few areas Magento lacked was building landing pages for displaying products from multiple categories without actually creating a new category. This extension allows us to build SEO and Marketing optimized landing pages with ease. Nach langem Suche habe ich nun diese Extension ausprobiert und positiv überrascht. Alles was ich umsetzen wollte, habe ich mit dieser Extension realisiert. Ich habe Themengebundenen Seiten erstellt und für Kunden optimiert und Kunden haben jetzt mehr Überblick. Also wer an SEO denkt, sollte an diese Extension blick werfen. When the Module together with another one we bought from Amasty was showing strange behaviour we thought it had to do with the modules themselves. Apparently it was something edited in the core (unbelievable right?) by the company that worked for this client before us, but Amasty was the one to point this out to us. Products always work as intended! I have been using this module for a while and have chosen it because it has all the features I need. At the moment of the purchase I compared it with several other modules and it was the winner. I’m using that extension from April. I looked it at earlier but I needed support of individual meta data per page, and as soon as that function was added, I bought that module. The extension makes it really handy to create seo-optimized landing pages. We need that as we create promo pages quite often in our gifts store. We create seasonal individual pages with gifts for him, gifts for her, gifts for children, new gifts, etc. 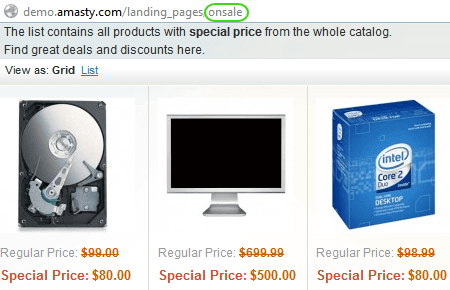 Landing Pages also lets set default sorting by price or best value which is very convenient. As such pages are temporal, they need to be redirected when promotions end. It would be great to have a redirect option on the general tab in addition to the page status. For example, there could be 4 options in the drop down: enabled, disabled, 302 redirect, 301 redirect, and once I choose one of the redirects, there appears a field for the destination URL. I hope to see that function in the next updates. But anyway, the extension is great. It’s not bug-free, of course, but still does its job well. Really handy extension to make multiple updates to products quickly. Top notch, super fast and efficient support means I can buy Amasty extensions with confidence that any problems will be resolved quickly. If you update products in your store, this is the extension you need! Advanced SEO tool for your e-store! Thank you, guys, for you constant updates! The advanced filter you've recently added is just great, it really makes my work easier and opens various opportunities for specifying flexible product conditions! Quick support - great job! Your support works amazingly. Had I written a ticket they answered me immediately and helped to set all the configurations needed. Thank you so much! This module is definitely worth the price I've paid. I've been looking for an effective tool for long time and now, I'm glad I've bough this one. It makes magic things with my SEO. I've just installed your extension, I hope it will solve all my SEO issues. Actually the Layered Navigation works pretty well with this module. Hi, Great extension guys, have purchased it with Improved Layered Navigation. One problem - cannot get Improved Layered navigation to work with Landing Pages, it is not picking up right URL and simply takes you to a list of original category (if clicked on category), rather than filtering out landing page's products. – Option to use layered navigation index to show parent products. E.g. when we filter by color, we want to show not just simple products, but the parent configurable product. – New flexible conditions - ability to select several attributes and combine them similar to shopping cart rules. – Ability to use either AND or OR logic for attribute conditions. – Multiple select attributes "is, is one of". – Support of category settings. 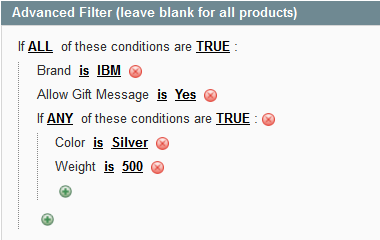 – Advanced filter for product attributes. – Links to landing pages added to the sitemap, after the CMS pages. – Ability to import landing pages from a csv file. – Bugfix for httpS and categories in layered navigation. – Ability to specify new products by the date of creation. – Bugfix for layered navigation. – Compatibility with older Magento versions.